For life to originate we need molecules capable of self-replication with sufficient flexibility and reactivity to achieve some function that helps those same molecules self-replicate. RNA (ribonucleic acid) is a molecule similar to DNA (deoxyribonucleic acid). 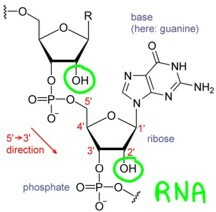 The added OH in RNA (circled above) makes RNA less stable than DNA and gives it a much richer, more varied chemistry. 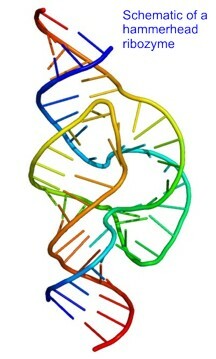 RNA is in principle capable of both self-replication and function. Chains of RNA have secondary structure (loops and folds) and tertiary structure (specific active three-dimensional shapes) and can catalyze reactions. For example ribosome is a protein-RNA complex that catalyzes peptide bond formation producing proteins. The catalytic active site of ribosome is all RNA. RNA (or a similar “pre-RNA” nucleic acid) is a promising candidate for the initiation of the process that led eventually to life. Much work is ongoing to understand RNA chemistry – a rich and fascinating subject. So what does Meyer have to say about the RNA world hypothesis? 1. RNA building blocks are hard to synthesize and easy to destroy. This is true – we do not have a workable hypothesis yet as to how RNA bases were formed in the “primordial soup.” It is an open research question. There is a big gap in our knowledge here. 2. Ribozymes (RNA chains capable of acting as catalysts) are poor substitutes for proteins. This is also true, but does not speak against the RNA world hypothesis. All an RNA has to do at the outset is perform a function that conveys a survival advantage for a specific RNA sequence. It does not need to perform the variety of functions proteins are responsible for in even the simplest of cells. 3. An RNA-based translation and coding system is implausible. He is right, as far as I know, that no explanation has yet been offered. This is not yet a solved problem, rather it is a hard problem – and one that will take a good deal of work in many labs. We simply do not know enough about the chemistry yet. There is a gap in our knowledge. That a pathway from self-replicating RNA to a simple cell is “implausible” is a judgment statement that is impossible to defend until we know a great deal more about the chemistry of nucleic acids in general. Finally Meyer’s discussion of the difficulties of the problem seems to start with the complexity of a simple cell and assume that much of this complexity is necessary from the beginning. This makes little sense – rather a plausible explanation will start with a very simple system and build up complexity. 4. The RNA world doesn’t explain the origin of genetic information. This is the cornerstone of the argument for ID advanced by Meyer and Dembski. They propose that the information content of RNA (or DNA) cannot be “grown” from a seed. This is also where the argument falls apart. The sequence specificity of RNA or DNA correlating specific three base codes with amino acids is more or less arbitrary. There appears to be no chemical reason why GCU codes for alanine and UCG codes for serine any more than there is a fundamental reason why 109 is the ascii code for m and 230 is the ascii code for µ. But once the code is established, specified sequences carry information. In one of the weakest arguments in the book Meyer ridicules this idea on pp. 277-279 with respect to the original proposal for DNA. He dismisses it again on p. 312-317 for RNA. How the code grew from sequence specificity that did arise from chemical function is an open research question (a gap in our knowledge). 5. Ribozyme engineering does not simulate undirected chemical evolution. Meyer appears to argue that anything we discover about RNA in careful “bite-size” experiments is irrelevant because we used our intelligence to design the experiments. Clearly such experiments do not prove abiogenesis – but they do build up the background knowledge required to begin to pose plausible mechanisms and pathways. Meyer concludes this chapter by implying that scientists looking for solutions to all of the complex problems involved in the origin of life are paddling around in circles and making no progress. 1. It is demonstrably more reasonable to reject the chance hypothesis than to accept it. 2. Meyer has rightly pointed out that there are gaps in our understanding of the origin of life. The biggest gap is actually his first problem above – the synthesis of the building blocks. 3. He suggests that lack of current understanding means that no mechanism or pathway will be forthcoming. 4. He misunderstands scientific method and thinking. 5. He attaches far too much importance to the “information problem” and will not think outside of the box about mechanisms for the growth of complexity. Does Meyer convince you? If so why? Do you think that Meyer’s arguments against an “RNA world” type hypothesis are essentially gap arguments? If not, why not? If so, why should we think that these gaps are permanent? Note added: Coincidentally Stephen Meyer has written a response to Darrel Falk’s review of his book. It is published today on Science and the Sacred. In his response Meyer deals with this chapter and he reiterates one of the arguments that I find problematic – that designed experiments only prove the power of design, not the plausibility of natural process. Read his response and comment – either there or here. This entry was posted in Intelligent Design, Science and Faith and tagged Intelligent Design, Signature. Bookmark the permalink.